One of the most beautiful things about this unique and lovely church in Palm Beach Gardens is the enormous windows high above the main aisle, which lend a sense of spaciousness and airiness that's uncommon to South Florida churches. This church is amongst the most beautiful in the entirety of this part of the state, with elegant stained glass windows, glowing warm wood, and classical lanterns hung from the ceiling. For a traditional church wedding we are allowed much more movement and latitude than is commonly given by the clergy, and so we prefer to photograph Catholic weddings here over many other nearby churches. 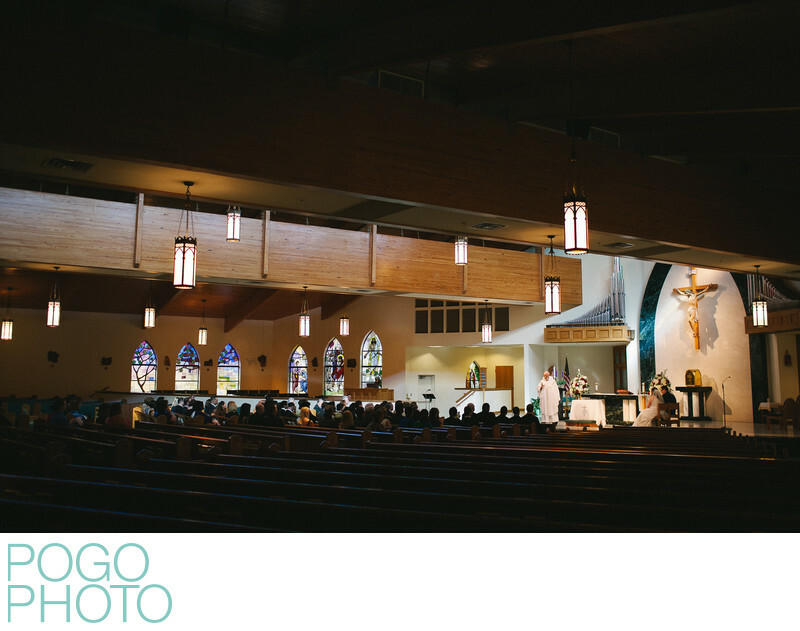 St Patrick Catholic Church provides modern Catholic ceremonies with all the due respect and gravity that the church requires, but with a sense of warmth and care that is sometimes missing when it’s not the parish of the couple getting married. Finding a way to photograph a Catholic ceremony that provides context within the physical space of the sanctuary is important; even when a couple chooses a church for location or convenience, the way it looks is either important before the wedding day or it will become important to the couple as a place they remember getting married for the rest of their lives, so we endeavor to create memorable images that transport the viewer to the pews. The contrast between the lit altar and daylight spilling through the overhead windows with the darkened side areas from this perspective creates a visual slash across the image, drawing the viewer’s attention directly to the seated bride and groom and to the priest, giving his homily in front of the altar’s crucifixion statue. The stained glass windows in the far background provide a cheery pop of color, and the silhouetted heads of the attending guests remind one of all the attendees of the wedding ceremony, bearing witness to the couple’s vows and promises. Location: St. Patrick Catholic Church, Palm Beach Gardens, Florida. 1/500; f/2.0; ISO 800; 35.0 mm.